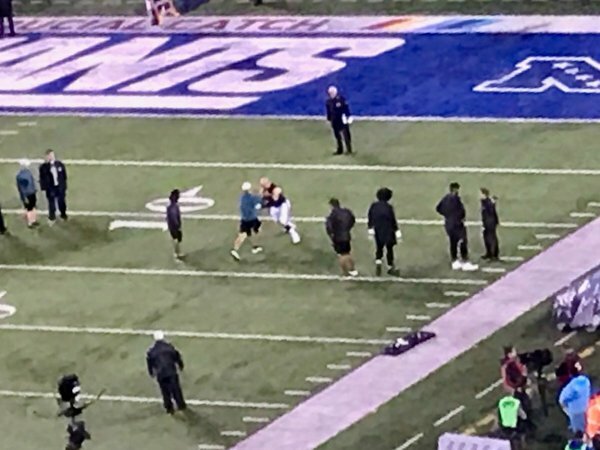 Lane Johnson is warming up in his game pants. That's a good sign. Eagles have used "11'' personnel (1RB, 1TE, 3WR) just 49.3 percent of the time in first five games. Used it 65.1 percent last season. If Lane Johnson is active, an interesting decision will be which depth OL is active: Mailata, Warmack, or Pryor? Warmack has the game experience. Mailata is the only one who played tackle throughout the summer. Pryor looked good during the summer. 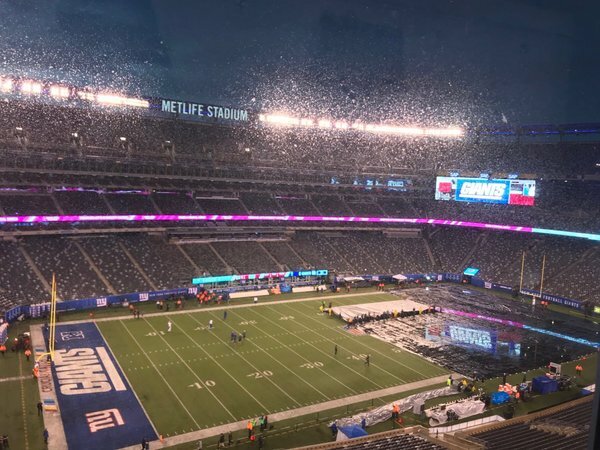 Raining at MetLife during preliminary warmups. Better question is which one is inactive, considering Nate Sudfeld will be one of the inactive. So Eagles will only need one of these three down. Lane Johnson is active for the #Eagles . So Eagles have Nate Sudfeld and Chance Warmack active tonight. ..And of course, Lane Johnson is active. Lane Johnson active. Chance Warmack is active for the first time this season. #Eagles inactives: D.J. Alexander, Nate Gerry, Corey Graham, Jordan Mailata, Haloti Ngata, Matt Pryor, Darren Sproles. 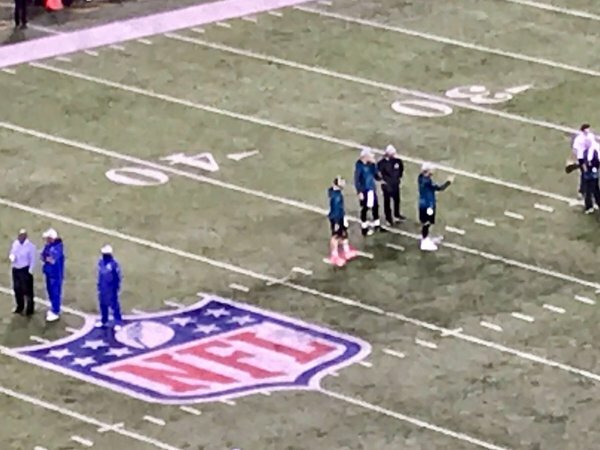 Other than Jordan Mailata and Matt Pryor, the inactives are the guys we knew weren't playing because of injury -- Sproles, Alexander, Gerry, Corey Graham, Haloti Ngata. Because there was a spot open, Nate Sudfeld is active for the first time this season. Because orangeish-pink is an awful looking color. Yeah I'm really coming out against breast cancer awareness. We kinda were too, given the late start and the need for a notebook lede. Trying again with this -- Sudfeld active for the first time since Wentz's return. I figure they were just out of healthy players to dress. Lane's playing, and they added Warmack to the actives. Better chance you need yet another OL or a third QB? Not sure it matters. Or maybe Sud is the Thursday night Taysom Hill. Carson Wentz v. Vikings by personnel grouping: 11 personnel -- 14-for-17=231 yards, 1 TD, 0 INT, 1 sack; 12 personnel -- 9-for-16=76 yards, 1 TD, 0 INT, 2 sacks; 13 personnel -- 1-for-2=4 yards. Eagles RB Wendell Smallwood is averaging 6.4 yards per carry on first down this season. Fourteen of his 25 carries have been on first down. Carson Wentz has completed just 12 of 27 passes on third down. He's been. He's been sacked four times on third down. Was sacked just seven times on third down in 13 starts last season. The Giants fined Odell Beckham for his comments in that ESPN interview, according to @JayGlazer . 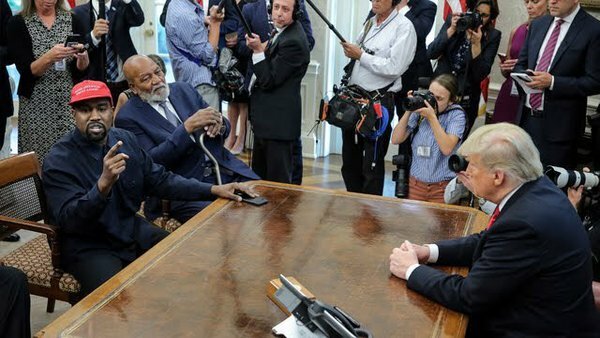 It's unclear if anyone punished Lil' Wayne. Zach Ertz has been targeted 58 times and has 41 receptions for 487 yards and 1 TD. He has 21 receiving first downs and six third-down receptions.